Every year over 75 million dogs, cats, chinchillas, seals, foxes and other animals are murdered for the production of fur coats and fur accessories. Killing is completely unnecessary, and animals experience terrible pain and suffering. Animals caught in the wild die a slow death for days in traps. Those kept on farms suffer from birth in small, dirty cages until their death, which is caused by electric shock, breaking of their neck or suffocation with gas. Collars and other accessories are often ignored, although more animals are killed for them than for the whole coats. 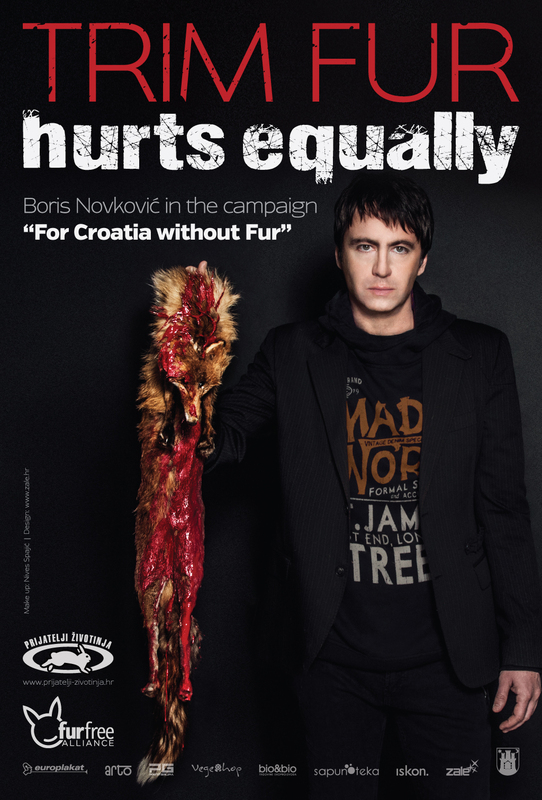 That is why the singer and songwriter Boris Novkovic will draw attention to this problem within the campaign "For Croatia without Fur" by appearing on ads "Trim Fur Hurts Equally," which will be placed in Croatian cities. Boris explains his efforts for animals used and killed for their fur with these words: "Even if fur had a purpose during the old, primal and primitive civilizations when there was no replacement for it, today when there are adequate and better quality replacements of the original, there is no point to it except violence and to destroy the natural balance out of spite." Currently there are many great choices of non-animal materials that really give us the opportunity to protect ourselves from the cold and be fashionable without killing any animals. Apart from that, fur is not ecological because natural resources, drinking water and dangerous chemicals are relentlessly being used for its production. 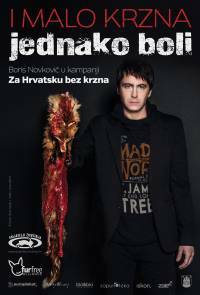 In Croatia and in the world there are stores that refuse to sell animal fur, and the list of those stores can be found here and on www.furfreeretailer.com. 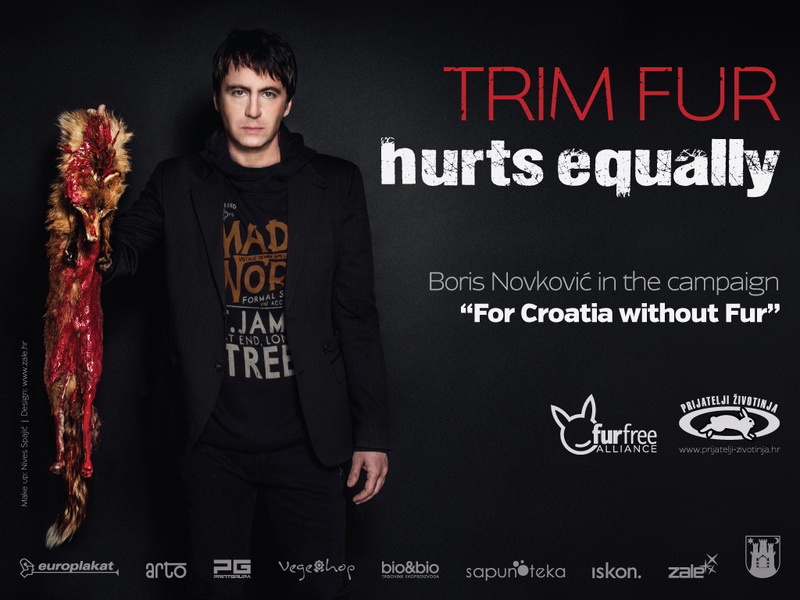 The ad "Trim Fur Hurts Equally" was made by Maja Zaklan from the Design Studio Zale, while Nives Spajic did the make up. 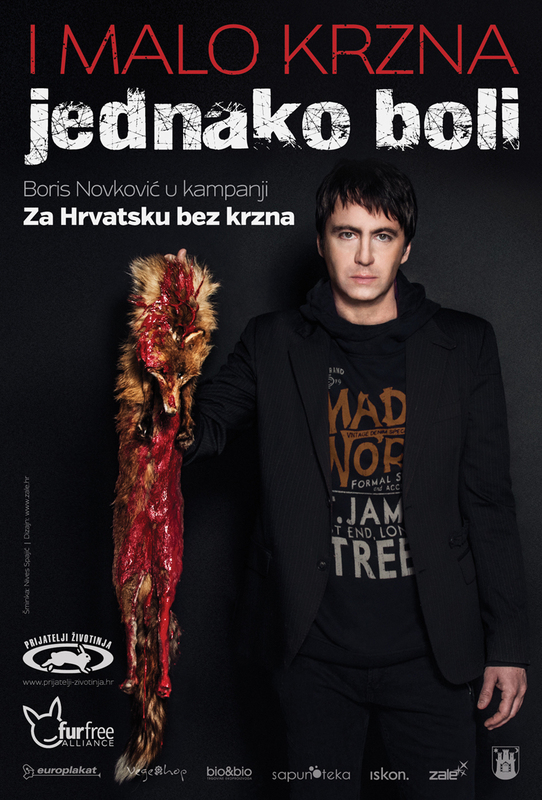 The project was realized in collaboration with Fur Free Alliance and the City Office of Agriculture and Forestry of the city of Zagreb, and it was supported by Zale, Iskon, Europlakat, Arto, Print grupa, Sapunoteka, Vegeshop and bio&bio. Boris Novkovic's statement regarding participation in the project "Trim Fur Hurts Equally"
This little contribution and cry of mine is a part of a much larger cry that Animal Friends has been sending out to the public for years is only a small grain in the sand of a huge desert, but connected with all other grains that make up a vastness of sand. All of us are connected this way in a joint effort and together we make powerful dunes. I talk about connection because everything in this world is really one. We are all one and so close and near each other, without being aware of it. By mistreating others, destroying other species, beings and our different friends who we share this world with - and all for a whim which is absolutely replaceable - we are upsetting the natural balance, we hinder ourselves, and even worse, we hinder our children and their descendants. Even f fur had a purpose during the old, primal and primitive civilizations when there was no replacement for it, today when there are adequate and better quality replacements of the original, there is no point to it except for violence and to destroy the natural balance out of spite. For that reason, be a part of one universe, one common higher self, one divine consciousness and love and, say NO to violence, say NO to killing, say NO to cruelty, say NO to fur.